FLIP: You can add 1 "Subterror" card from your Deck to your hand, except "Subterror Guru". You can target 1 other face-up monster on the field; change that monster, also this card, to face-down Defense Position. This is a Quick Effect if you control another "Subterror" card. You can only use each effect of "Subterror Guru" once per turn. 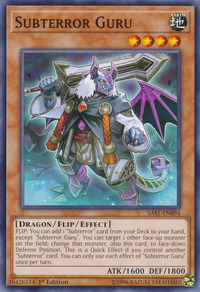 This card is the first Dragon Flip monster. Subterror Guru is the second Subterror card that was not introduced in the TCG first, following Subterror Behemoth Fiendess. This card is also the second Level 4 Subterror monster following Subterror Nemesis Warrior, thus breaking the tradition of having 1 monster per Level of this archetype. Subterror Behemoth Speleogeist bears a resemblance to this monster, which might mean the former being its true form.